On the 4th of April the School of Law hosted Law for a Day for secondary school students. The day is designed to allow second level students to experience what it is like to be an undergraduate law student. The day was organised by Dr Norah Burns and Carol Huguet of the School of Law. The students were welcomed in the morning to the UL Campus and received an introductory talk from Dr Burns. The students then attended a criminal procedure lecture with Dr Andrea Ryan and a comparative legal systems lecture with Dr Catriona Moloney. Eoin O’Meara Daly a youth justice researcher with the REPPP project in the School of Law gave a presentation and hosted a workshop on the influence criminal networks have on children’s offending behaviour in Ireland. The students were then given a talk by UL Law Society members Ciara Downes and Brian O’Rourke who spoke to the students about studying law in UL, Erasmus and study abroad opportunities and cooperative work placement. Professor Shane Kilcommins, Head of the School of Law spoke to the students about the various paths that a law student may take in their career after law school. The students also watched an interview that Dr Burns had conducted with Dean Strang, defence attorney in the Netflix documentary Making a Murderer. The interview was recorded specifically to be shown at Law for a Day. 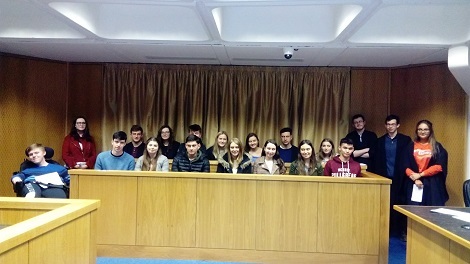 The day finished with the visiting students participating in a mock trial in the Moot Court room facilitated by Dr Lydia Bracken and Dr John Lombard.